NVD mounting plate adapters for GoPro cameras exists, so why not a mount specific for a standard ball cap? Luckily, Los Angeles-based SIDEKICK Mounts is covering this, with their Full Size POV Cap Mount, currently up for funding on Kickstarter. 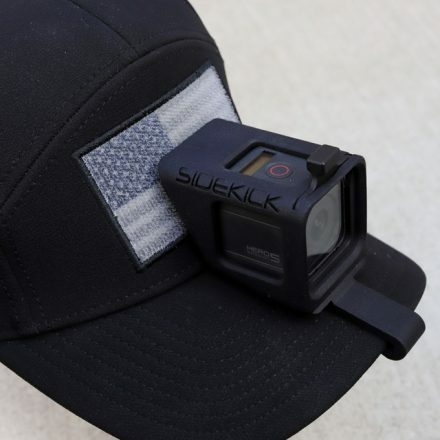 While there are GoPro mounting options for ball caps currently available, this one looks simple yet effective, securing in place with Velcro, and fully encompasses the camera body. In addition to the GoPro Hero series, SIDEKICK is also offering mounts for the BeHD and SJCamHD cameras, because the market loves variety. This entry was posted on Thursday, January 11th, 2018 at 00:42	and is filed under camera, crowdfunding. You can follow any responses to this entry through the RSS 2.0 feed. Both comments and pings are currently closed.